HOSTED BY METRO MARLINS SWIM TEAM. ELIGIBILITY: Open to all USS swimmers registered with Potomac Valley Swimming. Athletes must be 10 years old or older to enter this meet. RULES: The competition will be conducted in accordance with current United States Swimming rules. The meet will conclude no later than 12:00 noon. SEEDING: The meet will be seeded and swum according to submitted entry times regardless of age group. Heats will be swum fastest to slowest, alternating Women and Men. The Meet Director will contact teams no later than 72 hours in advance with team's seeding. QUALIFYING TIME: Any swimmer who has equaled or bettered 25:00.00 for 1500 meters/1650 yards. AWARDS: First through sixth place medals in the following age groups: 10, 11, 12, 13, 14, and 15 & Over. OFFICIALS: Swimmers must provide their own timer. ENTRIES & FEES: All entries are $3.50. Each club is requested to submit one check to cover fees for the entire team. Be sure entry cards include the best 1500 meter time and the age of swimmer. A Potomac Valley Master Entry Sheet is required and should include the name of the Club entry person. NO LATE ENTRIES ARE PERMITTED FOR DISTANCE MEETS. SCHEDULE:	 WARM-UP: 6:00 A.M.	FIRST HEAT: 6:45 A.M.
5:00 P.M., TUESDAY, 26 MAY 1998. 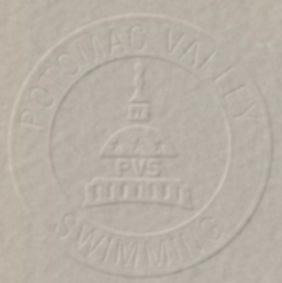 CHECKS: Make checks payable to POTOMAC VALLEY SWIMMING. REMINDER: ENTRY FEES ARE DUE WITH THE MEET ENTRY. UNPAID FEES WILL BE REPORTED TO THE BOARD OF DIRECTORS AT THE CONCLUSION OF THE MEET.